You know how sometimes the stars align and all things just seem to fall into place? It's been awhile since this happened to me but alas, this is how it happened for this cake. 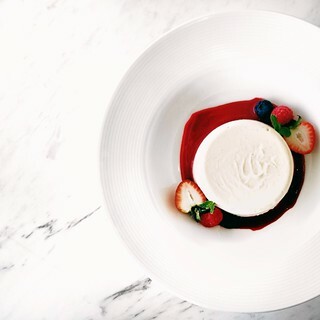 It all started with my going through Ms Lawson's entire season of Nigella Bites during my last business trip (weekdays, hotel room, tired and extremely comfortable on the couch after dinner out/room service - you get the picture). I discovered her chocolate lime cheesecake in that process. I've not baked a lot of cheesecakes but I know this much - a good cheesecake doesn't need to be complicated, fiddly water bath in roasting tray notwithstanding. This cake was then etched like stone in my mind. Even without tasting it, I was convinced it would be great, despite my previous cake by Ms Lawson not really living up to its promises. Then came that trip to Takashimaya's Cold Storage I made a few weeks ago because we were in town and I forgot to get the potatoes for this chicken I was supposed to make the next day. I'm not sure if my habit of browsing the fresh produce fridges even when I don't need anything from there is a curse or a blessing, because during this particular 'just looking around but really scrutinizing almost every interesting item available' session, I chanced on these perfectly round, yellow and plump Japanese yuzus. Ever since I saw Alan's beautiful yuzu chiffon, I started fantasizing of the day I'd make something out of the actual fruit instead of its bottled juices or dried rind. Never mind that each fruit was an eye-popping and purse-draining SGD7.90 a pop. Never mind also, that there were only three of them left, individually wrapped and all (what would one do with just one yuzu fruit, really?). As more than 20 dollars worth of three tiny citruses made their way into my basket, I had no idea what to do with them then but I just had to have them. I'm sure you can understand where I'm coming from. It's like Becky Bloomwood and that scarf for her sick aunt, you know? So more than a few days passed after those priced balls of sunshine ended up in my fridge. As I was on the verge of panic thinking of what to do with them, the perfect event came along to put two and two together - Vijay's birthday. As before, there would be cake - really, if you've been around here often enough, this wouldn't even come up as a question. 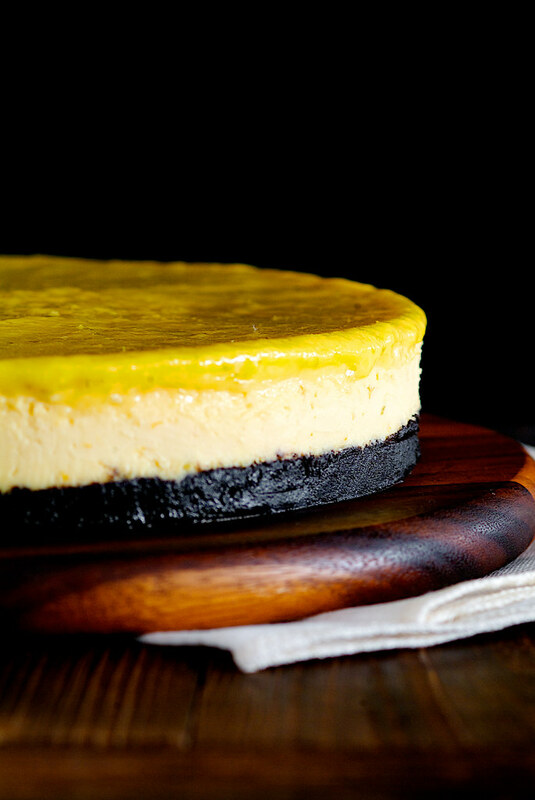 Also, as before, it would be a cheesecake, and what could be better than a chocolate yuzu cheesecake as a twist on my bookmarked recipe? Only I had not quite enough yuzus to produce an equal amount of juice of four limes, so a lime went in and I had to make the name of this adaptation a mouthful. The lime curd topping was kind of a last minute addition as the birthday boy made a passing comment - "So there'll be no frosting ah?" It didn't help that I forgot to bake the cake at the lower third of the oven instead of the middle. Brown spots and a tiny crack don't make a perfect birthday cake, so it was curd stirring over the stove in the middle of the night for me. The things we do for love [insert customary sigh here]. 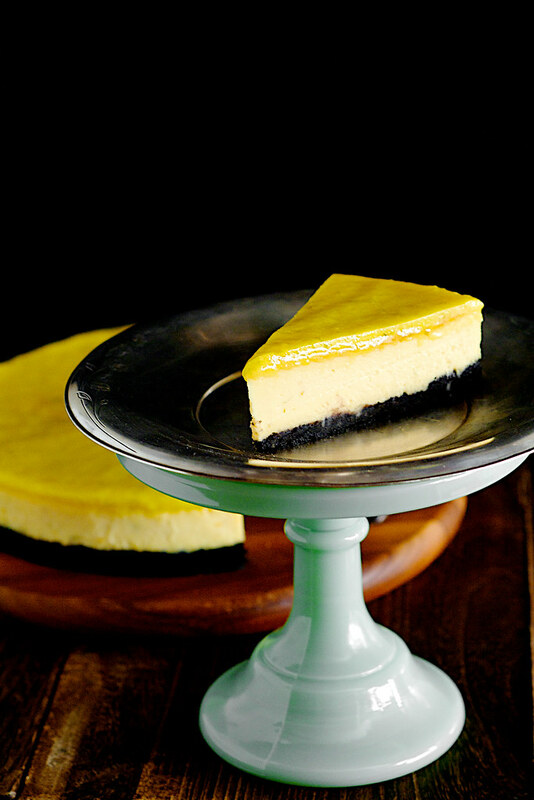 The lime curd, in the end, not only made the cake pretty but added an extra zing to each bite of salty, dark chocolate crust coupled with the smooth cheese filling, spiked just so with the exceptional, gentle, tang of yuzu. With my man happy, money well spent and Ms Lawson redeeming herself with a recipe for keeps, I had a fantastic week. You should too, with a slice of this on your plate. Adapted barely from Nigella Lawson's Chocolate Lime Cheesecake from her book and show Nigella Bites. Notes: I experimented with a mixture of yuzu and lime in the filling because as above, I really had only 3 yuzus and judging from the aroma of the citrus, 1 lime would be perfect to give the cake that refreshing lift it deserved. If you have more yuzus on hand, omitting the lime would give you a cake with another dimension of sophisticated and pure yuzu taste. Though not in the original recipe, I microplaned the zest from all the fruits; finding it the only way to do them (and the cake) justice. Done this way, the zests was very fine in texture and didn't affect the smoothness of the cheese custard at all. If yuzu is not available where you are, I would skip the lime curd or make it less tart at least, to balance out the filling. Lemon curd would be great too. Should you decide to go with the citrus curd topping, there will be about 1 cup of leftover, no need to thank me. Process the chocolate wafers until they are like crumbs, then add the butter and pulse again. Line the bottom of the springform tin, pressing the crumbs in with your hands or the back of the spoon. Put the tin in the fridge to set, and preheat the oven to 180°C/gas mark 4 and place the wire rack at the lower third of the oven. In a food processor or a stand mixer with the paddle attachment, beat the cream cheese gently until it's smooth, and then add the sugar. Beat in the eggs and egg yolks, then finally the zests and juices. Put a full kettle on. Pour the cream cheese filling onto the chilled cookie base, place the tin in a roasting tray and pour hot water from the recently boiled kettle around the foil-wrapped cheesecake to come about halfway up the sides of the springform. Don't overfill as you will risk spilling it on the way to the oven. Transfer it as steadily as you can to the oven and cook for 1 hour or so, checking after about 50 minutes. It should feel set, but not rigidly so. You want to be able to detect, below the top crumb, in Nigella's words - the slightest, sexiest hint of a quiver within. Take the roasting tin out of the oven, then gingerly remove the springform from its water-filled tin. Place the tin on a wire rack, peel off the outer layer of foil, tear away the side bits of the first layer of foil and leave it to cool. Meanwhile, prepare the lime curd (as per the lemon curd recipe here). 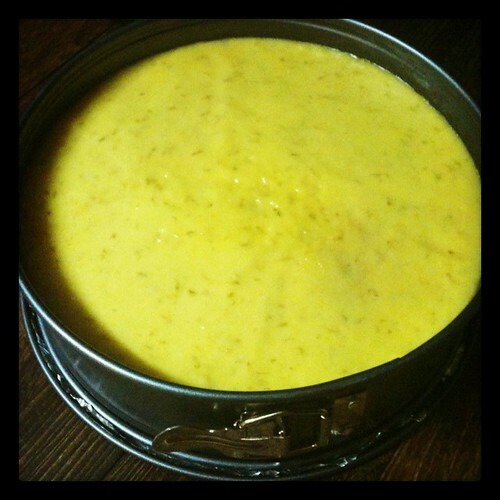 When the cheesecake has cooled down completely, pour about 1 cup worth of warm lime curd over the top and quickly tilt the tin to spread the topping around evenly. Smooth out with an offset spatula if necessary. Place the cake in the fridge and leave it there till 20 minutes or so before you want to serve it. To serve, I managed to get the springform base off by sliding the very cold cake off using the base of a tart tin. The foil was left intact though, it's hardly visible after I trimmed off the excess with a sharp paring knife. As per Nigella's advice, cutting the cake with a warm knife will yield prettier slices. Set the knife in a tall glass of hot water and wipe off after each cut. 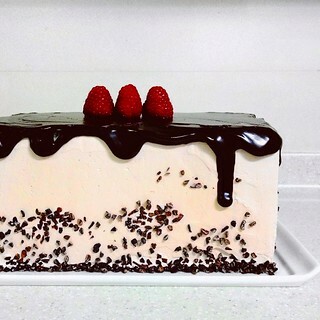 Cake keeps well covered in the refrigerator for up to 1 week. wow! that's one helluva yuzu cheesecake! glad you finally gotten them! now that you have tasted yuzu, i'm sure its no turning back! Oh yeah, did you happen to save the seeds??? If you did, please spare me some. Would love to try grow a plant out of it. but i heavily emphasise on the trying part! This looks delicious! 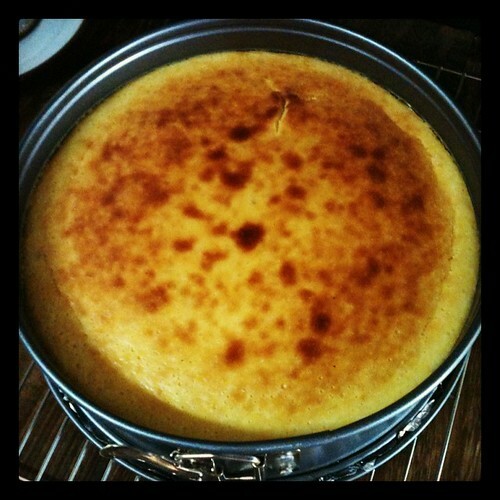 The cheesecake looks so pretty with the lime curd layer on top. What a handsome cake! Love all the twists you did on it! 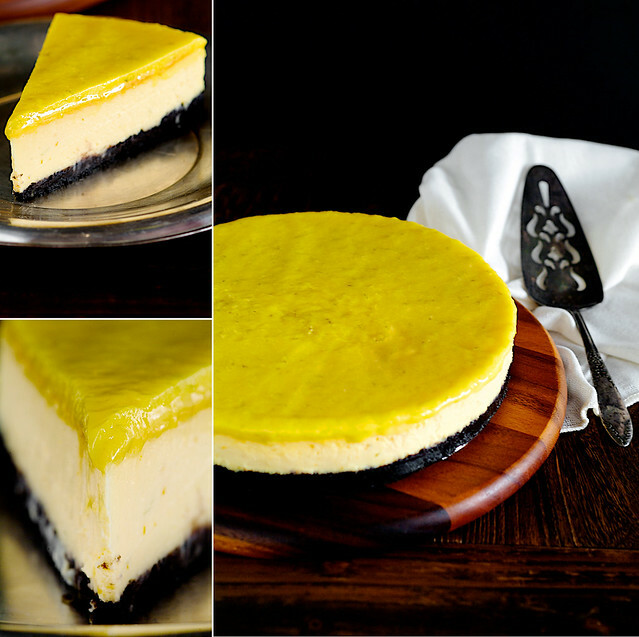 This is so lovely, and it makes me drool.Just heard about the yuzu lime.Reminds me that I haven't made a cheesecake since my last mango cheesecake. Vijay must be one happy birthday boy! 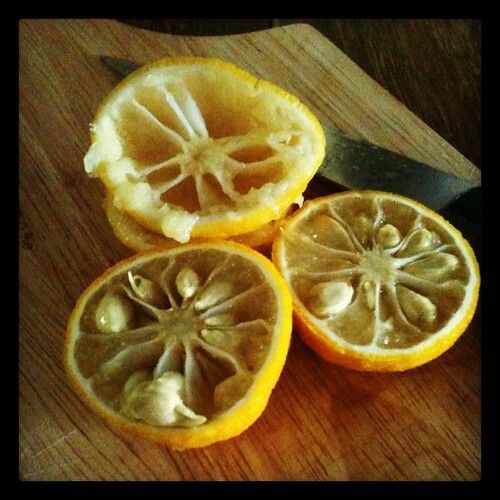 RibbonClown: Lime curd is lovely. I think I'll be making a lot of curds now, highly addictive and so versatile. 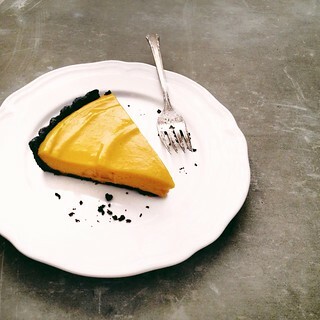 thelittleloaf: You can make all sorts of desserts and cakes with yuzu. Try looking for bottled juices if the fruit is not available. Alan: Thanks to you and Shirley for putting it out there. No, I totally forgot about the seeds, which is ironic because there were so MANY of them in those tiny fruits. Damn it, now I can only hope they still sell it at Taka. Pei Lin: Thank you! Too bad you don't eat them else I'd bring a slice for you. Kulsum: Thank you! You're right, the board I used is really a cheeseboard, similar to yours. I got it before I found my other wooden cake stands later. Love and other Spices: Love your nick! 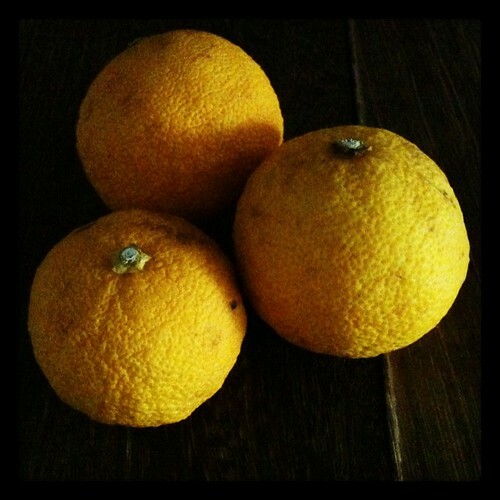 Yuzu is used in many diverse ways in Japanese cuisine. It's taste is unique and unparalleled. Shirley: You're right. I'm so glad I at least had the chance on these three little fruits! Vijay did enjoy the cake a lot, but he still prefers that over the top cappucino fudge cheesecake I made a few times before. Oh Lord. This looks so awesome that I almost fainted when I opened the page. Please help resuscitate me and send a slice over. I wish we can have yuzu lime here. Perhaps they will be popular in Oz land in a few years time! I really like the vibrant color of the cheesecake. Anh: Because of its price, I doubt that it'll be popular. Not sure if you can find bottled juices from Japanese supermarkets there like we do here though? 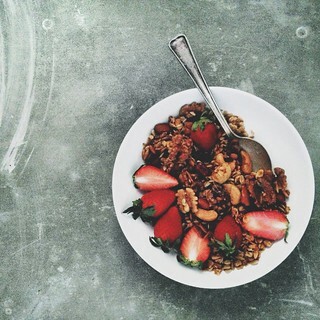 For me, I love the zest of the actual fruit. Really, the essense of it is all in the skin! LP: I got the cheeseboard from Robinson's kitchen department. You can get wooden cake stands from I Wanna Go Home at Tanglin Mall.